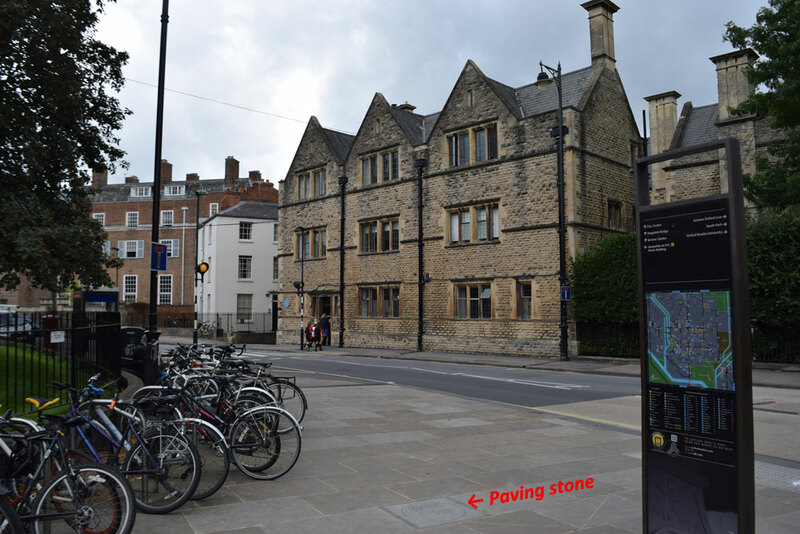 This Victoria Cross paving stone to Captain Noel Godfrey Chavasse was installed in September 2016 outside Magdalen College School, Oxford, where he was educated. 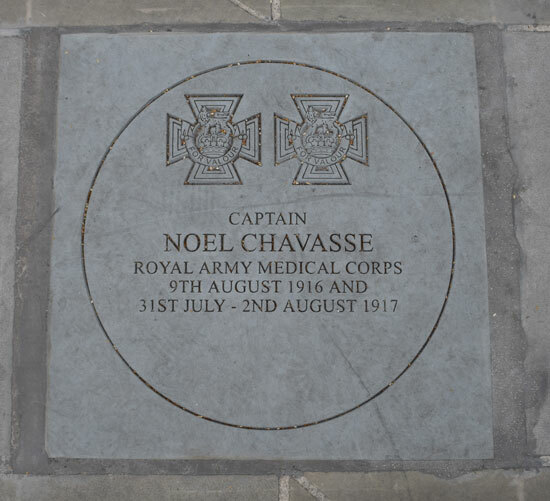 Chavasse was the only man in the First World War to win two Victoria Crosses: hence he is also the only man to have two special paving stones in the city of his birth, each of which depicts two Victoria Crosses at the top. Similarly his war grave also depicts two images. Chavasse was born in 1884 at the present 38 New Inn Hall Street, Oxford when his father was the Rector of St Peter-le-Bailey Church (now the Chapel of St Peter's College). He attended Magdalen College School in Oxford from 1897 to 1900, and then his father was appointed Bishop of Liverpool, and Noel transferred to Liverpool College. In 1904 he went up to Trinity College, Oxford, graduating with a First in Natural Science in 1908. He then read medicine at Liverpool and qualified as a Doctor of Medicine in 1912. Chavasse won his first Victoria Cross on 9 August 1916 at Guillemont on the Somme when he attended to the wounded all day under heavy fire, frequently in view of the enemy, and rescued three men the next day, altogether saving the lives of at least twenty men. Then on 2 August 1917 at Brandhoek he won a bar to his Victoria Cross for repeatedly crossing no man’s land in search of wounded men, even though he was seriously wounded himself. Two days after this second brave feat, he died from the wounds he sustained. In 1923 his father Francis Chavasse returned to Oxford, where and was the guiding spirit in establishing St Peter’s Hall, which opened a year after his death in 1929 and is now St Peter’s College. Noel's twin brother Christopher Maude Chavasse was appointed the first Master of St Peter’s Hall, and in 1940 became Bishop of Rochester.